As more and more states, counties and cities regulate solvents we DIYs use to clean parts, water-based or "aqueous" parts cleaners are getting to be mainstream. In recent years, the CAC's production evaluation team has tested a few of them and so far, while we haven't used one about which we could say flatly, "It didn't work. "; the parts cleaning performances of the ones we have used have been limited, at best. 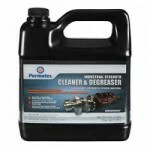 Our latest test of an aqueous cleaner and degreaser practical for DIYs is a new product from Permatex: "Industrial Strength Cleaner & Degreaser". Surprisingly, this stuff worked better than any aqueous parts cleaner we've tried to date. There are a few procedures to follow when using it. Before a cleaning session, surfaces must be cool to the touch. Do not use this product in direct sunlight or if the ambient temperature is above 100° F. Do not dilute Industrial Strength Cleaner. Use it full strength on a cool surface. Allow the product a little bit of time to penetrate the grease, but do not allow the product to dry on any surface. Rinse with water until no sudsing is noticeable then blow dry with shop air. Really dirty parts require brushing or a second application of the cleaner. In fact, "Permatex Industrial Strength Cleaner" worked so well, we were curious as to why other aqueous products we tried weren't as good. We contacted Permatex's PR agency and were put in touch with Dan Clarke who is a Senior Product Manager at Permatex. In an email exchange, Clarke told us, "It uses a basic chemistry with alkaline rather than acids to clean. That is what sets it apart from the others." In another email, he added, "Permatex Industrial Strength Cleaner & Degreaser contains nonionic surfactants with excellent surface wetting performance, anionic surfactant and highly-effective alkaline pH building additives. These are boosted by the presence of a propylene glycol-based solvent to assist in lifting the grease-based soil from the surface. (of the item being cleaned)"
Additionally, Permatex Industrial Strength Cleaner is non-flammable, biodegradable, VOC compliant and contains no petroleum-based solvents or acids. If you are in an area where solvent-based parts cleaners are either regulated or not available at all or you are someone who feels strongly about environmentally harsh chemicals, we recommend you try Permatex Industrial Strength Cleaner & Degreaser. For more information, see Permatex's web site.